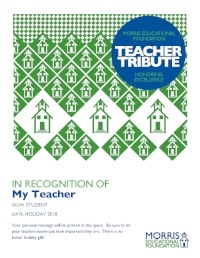 Each winter and spring the Morris Educational Foundation offers our Teacher Tribute program. Celebrate the people in the Morris School District who make a difference in your child’s life with a Teacher Tribute. You can acknowledge administrators, counselors, assistants, coaches, custodians, librarians, nurses, conductors, cafeteria staff, bus drivers, secretaries, and of course, teachers. With your tax-deductible Teacher Tribute donation, your honoree will receive a beautiful, personalized certificate that includes your individual message and best wishes. All you need to do is make a donation in your honoree’s name, and the MEF takes care of the rest. Please select your donation level below to begin the Teacher Tribute donation process. All orders must be received by December 14, 2018 to ensure delivery before Winter Break. All orders received after this date will be delivered in January 2019. This form stopped accepting submissions on January 9, 2019 12:00 am EST.